SFPUC’s rendering of the plan for a new plaza at Mission and Valencia Streets, created by converting two traffic lanes. Both projects appear to have garnered broad support among neighbors who participated in the design processes, though they each require the removal of a handful of car parking spaces — the usual point of contention in street redesigns. It’s a refreshing outcome compared to the battles over re-allocating car space typically seen in other city-led planning efforts. Only minor tweaks to the Mission and Valencia plan have been made following the last community meeting. Changes include the removal of greenery along the curb that faces Mission to make room for a bus stop to be moved there from across the street. Only 10 parking spaces will be removed for the sidewalk expansions, with some replacement spots added by converting parallel parking spots on the east side of Valencia to back-in angled parking. An SFPUC rendering of its plans for a “green street” on eastern Holloway Avenue. The plans for a “green street” on Holloway, between Ashton and Lee Avenues, are also expected bring a much calmer, greener street to an otherwise grey neighborhood. Many corners will get green bulb-outs, and where they aren’t, curbs will be painted red to remove parking spots where cars block sightlines between pedestrians and drivers — an improvement known as “daylighting.” Water-permeable pavement will also be added underneath parking lanes, which has the added benefit of visually narrowing the roadway and helping calm traffic. 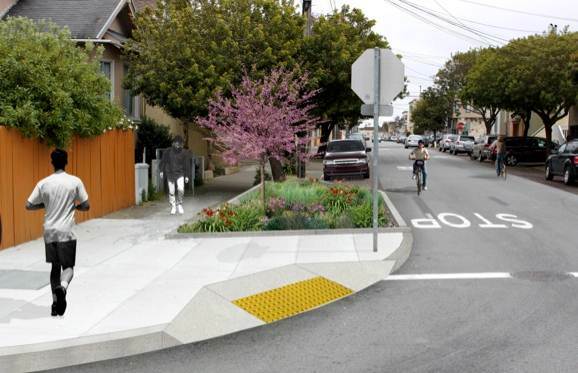 Although the SFPUC presented an alternative for Holloway that wouldn’t add any bulb-outs — only permeable pavement and rain gardens on the existing sidewalk space while preserving parking — attendees voted heavily in favor of the bulb-out option. Asked to rate each option using a five-star system, 41 attendees gave the bulb-outs five stars, compared to 14 for the option to preserve parking, according to the SFPUC. The Holloway and Mission/Valencia projects are part of a spate of street overhauls initiated by the SFPUC as part of its Sewer System Improvement Program, intended to replace the city’s underground sewer system and install rain gardens to reduce the amount of stormwater that runs into the sewers. Since those efforts require digging up the streets, livability and safety redesigns are being rolled in with them, bringing similar improvements to the Wiggle, three alleyways in Chinatown, Sunset Boulevard, and western Cesar Chavez. A construction timeline for the Mission and Valencia project has yet to be set, but the Holloway improvements are scheduled to be constructed from mid-2015 to mid-2016. Valencia at the entrance to Tiffany Avenue. The plan for a typical block of Holloway. 3) visibility on the part of cyclists towards motorists and vice versa in these minor-street intersections is quite high. A quick left-right survey and you’re good. Yet just the other week I was scolded “stop sign means stop” by a paternalistic and apparently very bored cop when there was not a soul around. I know this is lofty preaching-to-the-choir but policy+infrastructure changes need to address flat stretches like Holloway which actively discourage bicycling if you really do a full stop at every single stop along the way. There’s no reason for such an important long stretch of treasured flat land in SF to still stigmatize cycling. –> Of course a true complement to the area would not just be upgrading Holloway but Ocean to have a separated cycletrack instead of the laughable sharrows it currently has. I’m pretty brave and even I don’t use those. They’re a joke. –> As for Valencia, improvements are better than nothing but no cycletracks? (talking about Valencia here, not Tiffany which is already pretty good for cyclists). –> What about zebra stripes for pedestrians and a painted green lane across the intersection when you’re turning left from Tiffany/Duncan onto northbound Valencia? Even though there’s currently that bike waiting spot in the median cars are really not looking for cyclists to be coming out of there. I love these spaces but who will be maintaining them? If Divis is any indicator, these gardens will be full of weeds and trash. Even though they are not shown in the rendering, SFMTA is now making zebra stripes, or continental crosswalks, standard in any repaving situation. There was an article about this in Streetsblog from a couple of weeks ago. That’s a real concern, I agree. If storm water runoff control is going to be part of our general streets policy, then we’re going to need more city gardeners to keep these places looking good. Doesn’t seem to be quite standard. A single white line was painted on each side at 19th and Church (at the exit from Dolores Park), just a week ago. Sounds like the community is really behind this project. Can anyone comment on how the public outreach process differed from “other city-led planning efforts” (as referenced in the second paragraph)? Are there any lessons learned or ideas we could transfer elsewhere in the hope of achieving similarly positive outcomes? gardeners are cheaper than unblocking or replacing sewer pipes. About separated bike lanes on Mission between Valencia and Cortland that also improve bus traffic, how about using the three large capacity parking lots (Burger King, Bank of America, Safeway) for all parking needs and eliminating street parking?